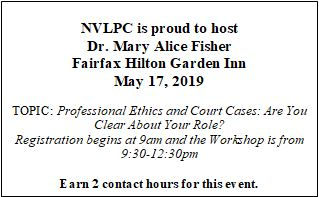 NVLPC is the professional organization for all people in or training to join the counseling profession in Northern Virginia. Our members consist of LPC's, counseling residents, counseling students, and others who work as mental health professionals in Virginia, Washington D.C., and Maryland. Our regular breakfast programs each month offer LPC's an easy way to earn CE's, and give all our members time to meet and greet their professional and student peers, and learn something interesting. We also have support for those who are working their way toward licensing. You have questions, NVLPC Resident Support Groups have answers. As a counseling student, we were all advised to join a professional association for our own benefit, and for the benefit of our profession. NVLPC is where you belong. Welcome to NVLPC! If you are new to us, we’re glad you’re here. NVLPC is a thriving, non-profit, volunteer run organization. We are dedicated to providing a venue for counselors, students and counselors in residence to gather, connect, and learn. We offer twice monthly breakfast seminars, NBCC approved for 1.5 CEU’s each, September-May. Twice a year we offer longer trainings for 2-4 hours, going a little more in-depth on a chosen topic in the fall, and one focused on ethics in the spring. We have a bi-monthly newsletter, a yahoo group, networking opportunities, and support groups for students and residents. We hope you’ll become a member and receive the full benefit of what we offer. All our trainings are discounted for members. Please explore this site to find out more about who we are and how you can get involved with us. Click here to join. Allow me to extend a special welcome to returning members; thank you so much for your participation. As a volunteer run organization, it is you, our members who keep us going. If you’ve been participating, but haven’t joined, I invite you to join now. For those of you who are members, consider becoming more involved. Volunteer for the board or join a committee. If you have an area of expertise to share, submit proposal for presenting at one of our breakfast seminars. It’s good to have you here with us. And please let us know how we might serve you better. Email us; your feedback is always welcome. I’m looking forward to a great year! This website works best when viewed using Chrome or Firefox as your browser. Would you like to get NVLPC emails, but not yet a member? Click here!